The fabrication of high-quality modern broadcast transmitters requires the efforts of many skilled hands, from the time of welding the first framework to the final assembly, inspection and running test. 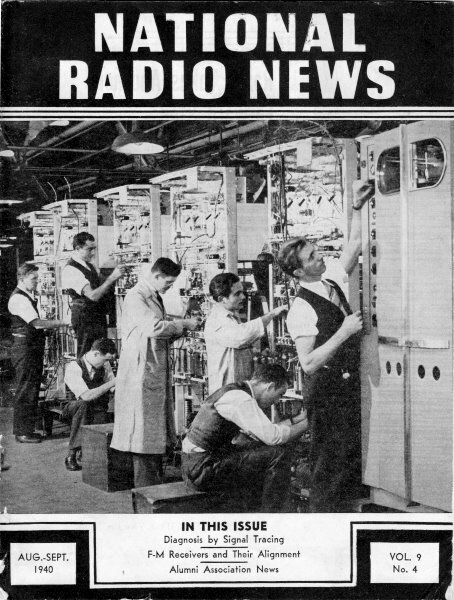 In our cover photograph you see trained radio men at work on five units, while the panel is being attached to the sixth unit at the extreme right. These units will be used in Western Electric broadcast transmitters. Photo by courtesy of Specialty Products Division, Kearny, N. J. Works, Western Electric Company.